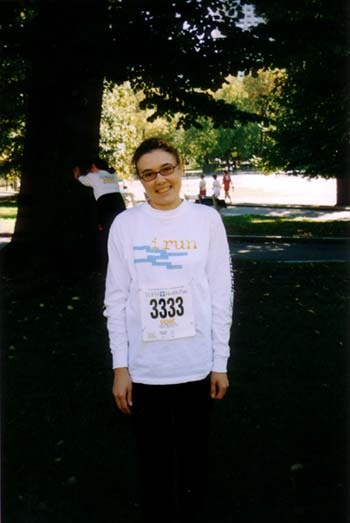 Today was the Tufts 10K for Women in Boston, and the weather cooperated nicely. I was at the race to cheer on my girls (Jen, Jen, and April -- and, while there, Jen and I ran into our former roommate Jen, so I was cheering on three Jens and one April by the end. I know. Life as a Jen is complicated, people). I had a great time cheering on my friends; I am an excellent fan. I was trying to get the people around me more into it (a la the Wellesley Scream Tunnel), but I didn't have much luck. I was smart and wore my Wellesley t-shirt, and a couple of the runners pointed to me and said "Wellesley!" which got them an extra loud scream. What was really cool about the race was that it was all women -- all ages, all sizes, moms pushing their kids, women in wheelchairs, and women who are much older than me and in much better shape. It was ... inspiring. It almost made me want to run it myself next year. But I think I'm much better suited to the sidelines.